A well-formed, finite Observable will invoke its observer’s onNext method zero or more times, and then will invoke either the onCompleted or onError method exactly once. The Materialize operator converts this series of invocations — both the original onNext notifications and the terminal onCompleted or onError notification — into a series of items emitted by an Observable. The Dematerialize operator reverses this process. It operates on an Observable that has previously been transformed by Materialize and returns it to its original form. materialize does not by default operate on any particular Scheduler. dematerialize does not by default operate on any particular Scheduler. In RxJava, materialize transforms the notifications from the source Observable into Notification objects and emits them as the emissions from the Observable it returns. 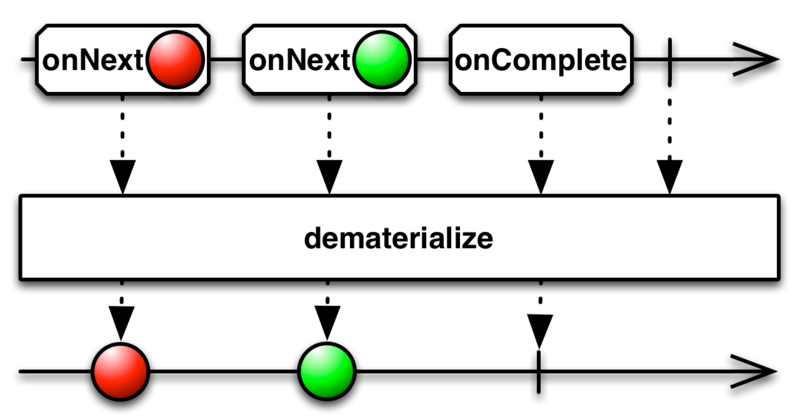 dematerialize reverses this process: converting the emitted Notification objects from the source Observable into notifications from the resulting Observable. RxJS only implements the dematerialize operator. If you want a “materialized” Observable, you have to assemble it by hand by manually creating and emitting the Notification objects that represent Observable notification calls. RxPHP implements this operator as materialize. Materializes the implicit notifications of an observable sequence as explicit notifications. RxPHP also has an operator dematerialize. Dematerializes the explicit notification values of an observable sequence as implicit notifications.